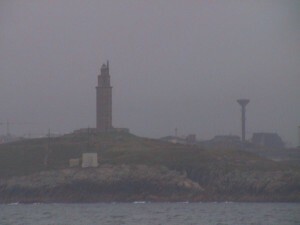 On the coast of La Coruña, Spain there is a very old tower built of stones. The Tower of Hercules was built in 2nd century AD, which makes it the oldest working Rroman lighthouse. It has been retrofitted over time and it continues to be a fully functioning lighthouse. It has a fog horn, a flashing light at a height of just over 100 meters, and a radiobeacon. It is very impressive to see. There are tours of the tower and buses full of people come daily to see it. You can even walk up narrow circular stairs to get to an observation area near the top. I’ve been up there too many times, for different reasons and on different occasions. Regardless of the why or how, one thought always crossed my mind: What it would be like to see this tower from sea after a long voyage?. 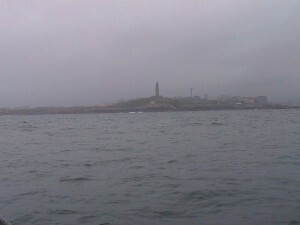 On June 24th, we were able to see the tower from O’Comillas. Despite being very foggy and even rainy at times, it was still a very emotional moment for Dad and I. We hugged and almost together said: “We made it!” It was perhaps the only time that I could almost see my father getting emotional since he hides it so well. Afterwards he told me he was having a lot of memories from when he left home at age fifteen. It was also raining then. José Manuel continued joking about the weather calling it “typical” Galicia weather and noting that the only time in the whole trip that we encountered gray skies was arriving in Galicia. Oh, well. That must be why Gallegos have so much morriña when away from home.